Every Jaipur Fort That Is Just Right for Your Pre-Wedding Shoot | Wedding Tips ARE YOU A VENDOR? The pre-wedding couple shoot ritual has now become a custom, not to be taken lightly. It is the official beginning of a couple’s wedding-roadshow, embarking on the phase of gala-family gatherings and celebrations. 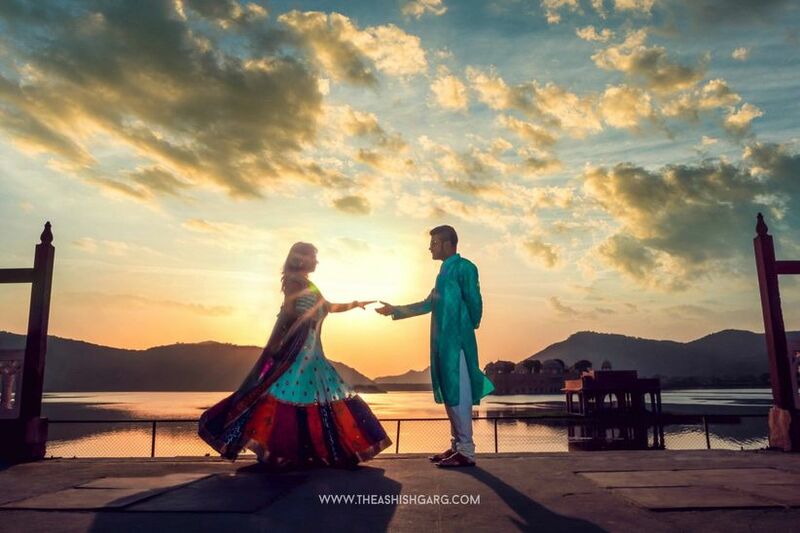 Hence, it is crucial to execute a pre-wedding couple’s shoot that defines them both as individuals, their journey together and the elements of their togetherness. The photographer and the couple sit together, deciding on the location, backdrops, props, clothing and cinematography that complements their personality well. 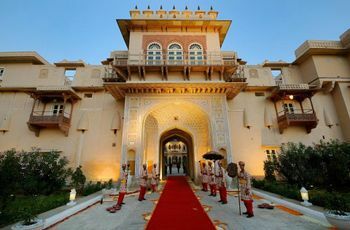 If you and your partner plan on getting married in Jaipur or have been looking for architectural marvels that signify the royalty of Rajasthan for your photo shoot, then this list is for you! 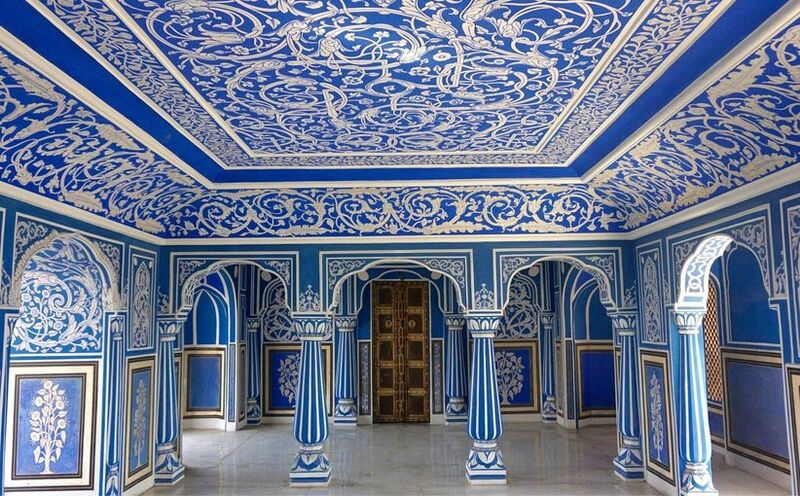 Spoiler alert - this palace has some secret rooms with spectacular shoot backdrops not to be missed. The Jaipur City Palace was Constructed by Maharaja Sawai Jai Singh II and was completed in the year 1732. It is a complex consisting of Mahals that are different in interiors and architectures, done in an amalgamation of Mughal and Rajput styles. This juxtaposition of various Mahals is what makes this Jaipur fort a perfect location to do a contrasting pre-wedding shoot. The beautiful complex includes many structures, lush gardens and courtyards, a museum and even a temple to brilliantly built buildings. Some of the most beautiful palace locations are closed for the general public but are open to visitors for a fee. Permission Details: Only tickets need to be purchased from the ticket counter. Originally built to make duck hunting parties stay in the city, the Mahal was constructed by Maharaja Madho Singh I. Similar to the Jaipur City Palace, the Jal Mahal also has signs and significance of the bond that was formed between the Mughals and the Rajputs which reflects in its architecture. Standing resolute in the middle of the Man Sagar lake, the Mahal, though consisting of 5 floors in total, has only 1 of the floor above water. A brilliant place to conduct a pre-wedding shoot here in the midst of the vast and pristine lake, the photographer can explore taking panoramic shots of the couple. Important Shoot Locations: The palace is not open to visitors, but the boundary line across the lake serves as the perfect shoot location. For an up and close backdrop, take a boat ride around Jal Mahal. Permission Details: Not open for public. 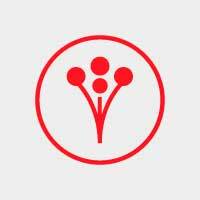 Timings For Shoot: No restrictions, although the ideal time to visit for a shoot is early morning, the golden-hour of the day or afternoons of any weekdays for limited crowd presence. Perched atop the Aravalli ranges, Jaigarh Fort was built between 15th and 18th century. Its grand architecture set in red sand-stones attracts tourists from all over. A 15 km drive from the city centre, this Jaipur fort offers a 360 degrees view of the entire Jaipur city. This fort was earlier used as a residential complex for the Maharaja but was later converted into a warehouse for storing artilleries. Since this fort is spread across a borderline of 3 km in length, it is highly advisable to walk up to the shoot location wearing sports shoes. Given its artillery storage status, Jaigarh fort today houses the world’s greatest canon on wheels, known famously as the ‘Jaivana Canon’. Important Shoot Locations: Jaivana Canon, Laxmi Vilas, Aram Mandir complex, garden premises and borderline of this Jaipur fort. Permission Details: No permission needed. Nahargarh Fort was originally named Sudarshangarh Fort but was later renamed to Nahargarh which means 'Abode of Tigers' to pay homage to the wild beasts and a folklore character named Nahar Singh. The medieval architecture and the wonderfully scenic views of the fort make this location perfect for the pre-wedding shoot. The Madhavendra Bhawan inside the complex is a must visit with its stunning frescos to gawk upon. 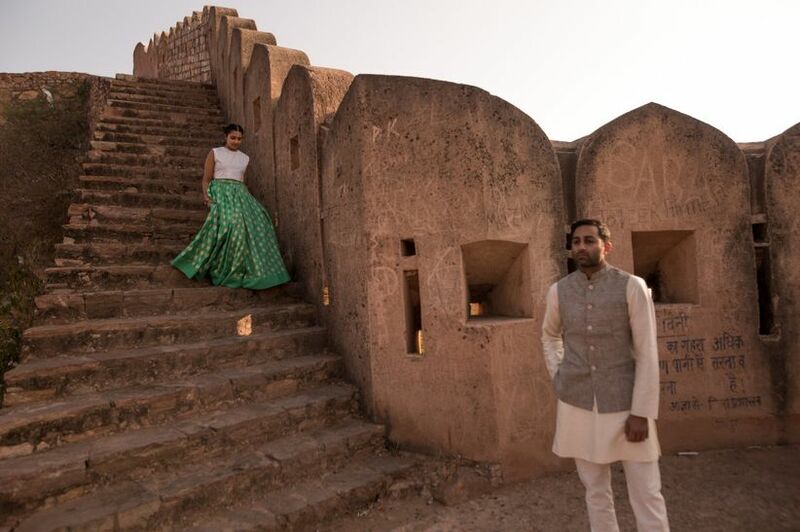 Fun fact - an extended wall from Nahargarh fort connects it to the Jaigarh Fort, making pre-wedding photoshoot possible at both the locations time-saving. This Jaipur Fort boasts of an Indo-European architecture that makes this location stand-out among other forts for the pre-wedding shoot. 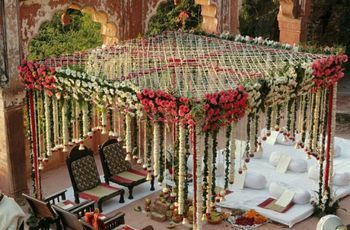 Important Shoot Locations: Diwan-I-Aam, Tadigate, Madhavendra Bhawan and the roof terrace. The most frequented fort of Jaipur, Amber Fort is the main tourist attraction of the city. Built in the year 1592, Amber or Amer Fort was originally the state's capital. Situated on a hill near the Maota lake, this magnificent multi-storeyed fort was constructed in red sandstone and marble. Given its history, the fort's architecture is a mixed-art culture between Hindu and Muslim schools of architecture. The four-storeyed courtyard layout of this Jaipur Fort gives the wedding photographer various backdrops for the photoshoot. 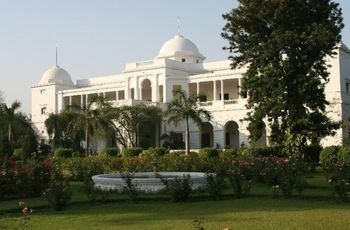 Important Shoot Locations: The Suraj Pol, Jaleb Chowk, Jharokhas, Diwan-E-Aam, Diwan-E-Khas, Jai Mandir, Ganesh Pol, Sheesh Mahal, Sukh Mahal and Baradari Pavilion. Permission Details: Just the tickets are sufficient. Extra Tip: Take a night tour of the palace and try to get clicked against the well-lit architecture of this palace; while you’re at it! Since powder room facilities at such locations are limited, avoid carrying with you a change of clothes. Map out all the Jaipur forts that you would like to get clicked at and divide shoot timelines between 2-3 days because travelling and walking up the locations is time-consuming and cannot be covered in just one day. Above everything else, remember to get clicked during the golden hour of the day, which is right after the sunrise and right before the sunset, for the most vibrant photo shoot experience. Since these forts mostly rely on natural sunlight, it is highly advised to be on time for all the locations. 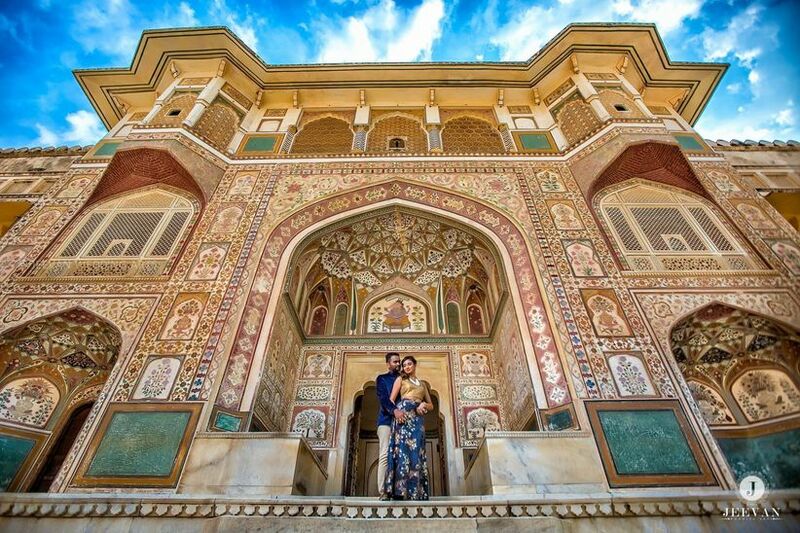 Which Jaipur Fort would you like to include in your pre-wedding shoot locations?